The dashing peoples over at Godzilla Goes to Paris are currently featuring our new Made in Space collection. In the past month alone the Godzilla team have covered the likes of Splendour in the Grass, Saint Augustine Academy, XII Letter, Recreational Jewellery and the great man Jonathan Zawada so you know they've got their finger on the pulse. If you've got a pulse you should probably cruise on over and check out their site. 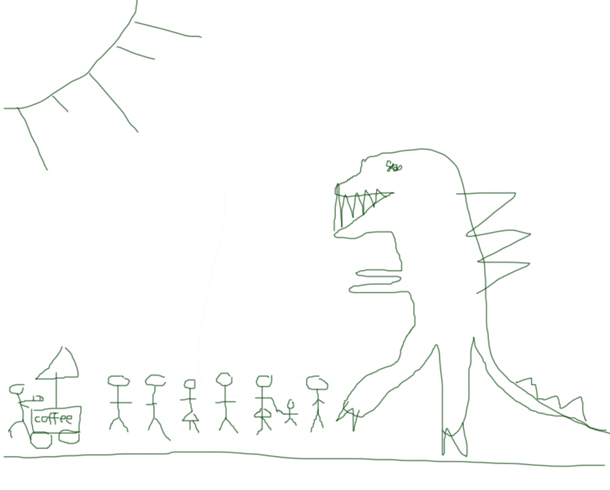 Here is Godzilla waiting in line for coffee. He has heard this guy makes a good latte. 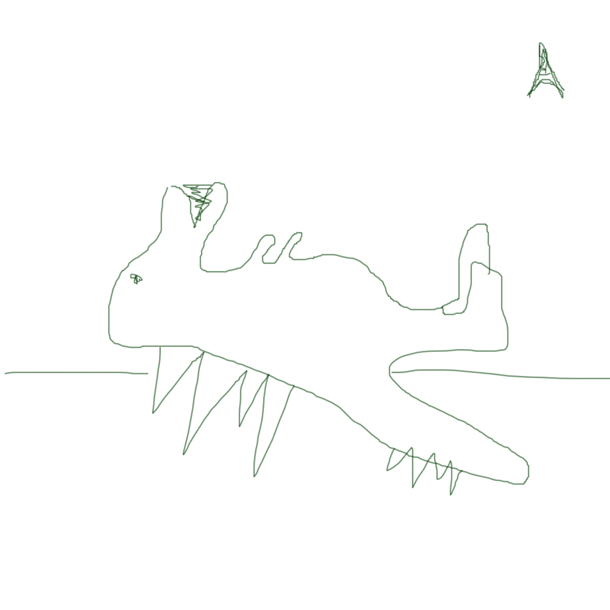 Here is Godzilla lying down on the outskirts of Paris. He has indigestion from eating too many baguettes. You can tell he is on the outskirts because the Eiffel Tower is so far in the distance. Here is Godzilla making sweet passionate love to giant lady called Rhonda that he met on the Champs Elysees. Paris is, after all, the City of Love. Rhonda is leaning against a traffic light for support...it is not easy being taken from behind by a 300-foot monster. Godzilla said he would call Rhonda but he never did. We hope you enjoyed Godzilla's adventures around Paris as much as you will enjoy adventuring around Godzilla Goes to Paris. The write up was on Godzilla Goes to Paris, which appears to no longer exist. This is sad but I guess we will have to wipe our tears and soldier on as this is the way of the world. Have a wonderful day in paradise.